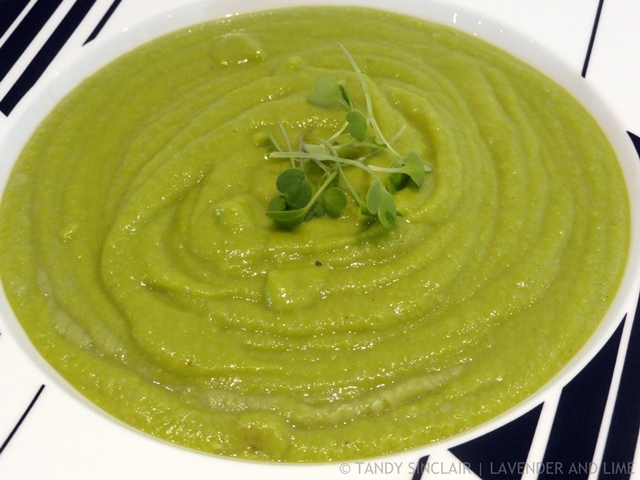 I was inspired to make a pea velouté after our lunch at La Mouette. This was served with scallops and a black pudding crumb and I really loved the flavour combination. I didn’t start watching My Kitchen Rules until recently. Dave and I picked up this show well into its existence . We watched the UK one together . And I watched the most recent Australian version to be aired in South Africa. The second season of the South African competition has just started here. Given the three different countries, I personally prefer the Australian version. But in all three, timing is the key to success. I recently hosted a dinner party for eight people. My menu was as follows – scallops served with pea velouté and a black pudding crumb; osso bucco with truffle mash and glazed carrots; lavender and lime crème brûlée with a tuile. In MKR for their first instant restaurants the contestants get given time to shop. Then they come home, unpack and set up their tables. After this they get 3 hours to prepare their three courses. Once the guests arrive they have another slot of time (not given) before the judges arrive. At this stage they are expected to serve up their 3 courses, with no time constraints. As the competition progresses timing becomes more and more critical. With this in mind, I decided to time myself from when I started my prep. This time included me setting the table and washing the dishes and making sure everything was ready to go for when my guests arrived. In 3 hours and 52 minutes I was ready to relax. My guests arrived at 18h30 and we spent time chatting and having drinks before I served my starters. At this stage, Dave helped me with cooking and plating. Dessert was served at 20h30 and at no stage did anyone feel rushed! What amazed me is that if I can do this why can’t the contestants? Dave and I are hopefully back from overseas. As today is my first day back, please be patient while I get to all the comments. Did you follow our trip by taking a look at our holiday blog? i make a very similar soup to this but i often throw in some zucchinis as well to bulk it out. delicious! Hi Tandy, Once you’ve done the washing and ironing….you can check your messages and comments! Do hope you have had a fantastic holiday and feel somewhat….rested? 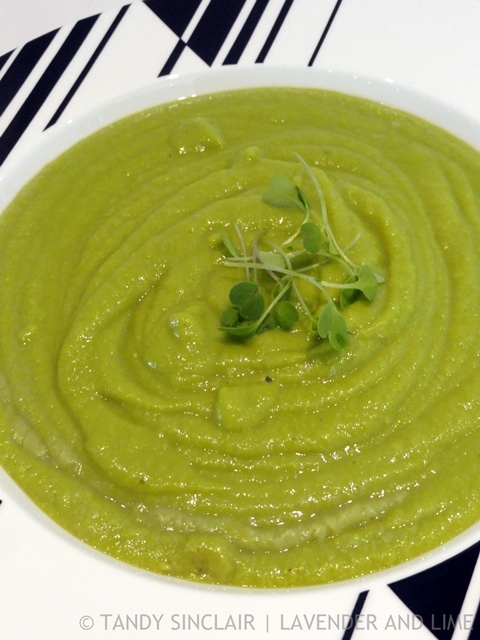 I like your recipe for Pea Revoute. Simple and filling with crusty bread. We’ve just had a quick snack for lunch. Another simple (Jewish ) dish: Boiled and chopped eggs with salt, add butter/or ali-oli (garlic sauce) or mayonnaise. Eat on crackers or crusty bread with pickles.Yum. Am an Australian ‘foodie’ who is grateful having had decades of opportunities to savour food around the world. Am very proud of and always try to watch our Masterchef which we now send to some 230 countries. MKR, to my way of thinking and that of most of my local friends, is a soap opera the ratings for which are more based on the planned and orchestrated drama of interpersonal hates and jealousies than food preparation . . . those making it have oft had to agree: people supposedly like it thus ! You had a lovely menu: osso buco being one of my favourite dinner offerings also but with classic rice . . . but in decades of loving my friends with food I don’t think dessert, if served, has ever arrived before 11pm and oft later . . . that is how we live, I guess . . .